It’s the last Tuesday of the month, which means another Game Night Blog Carnival is underway. I’m joining several other RPG bloggers to discuss board and card games that are fun to play when the D&D group can’t get together, for whatever reason. For the past month or so, I have become absolutely addicted to a new tabletop game. One of my close gaming friends had encouraged me for more than a year to check it out. It took several other gamers from the area getting started before I relented. I’ve always been leery of “lifestyle” games, those in which there is an entire hobby and culture based around the experience. So far, though, I am having a great time playing Warmachine/Hordes. You might be wondering which game I am playing; is it Warmachine or Hordes? The two games are different from one another, but fully compatible. Warmachine has a steampunk feel, with mechs, guns, and artillery, while Hordes includes monstrous creatures, and more traditional fantasy elements. From a rules perspective, there are some distinctions between the two games, as well. There’s so much in common between the two systems, though, that they are totally interchangeable, to the point that you can play Warmachine vs. Hordes seamlessly. Thus, most players refer to them interchangeably. Both games are probably best described as miniatures wargames. Players can choose from a whole host of models, depending on the faction they choose. 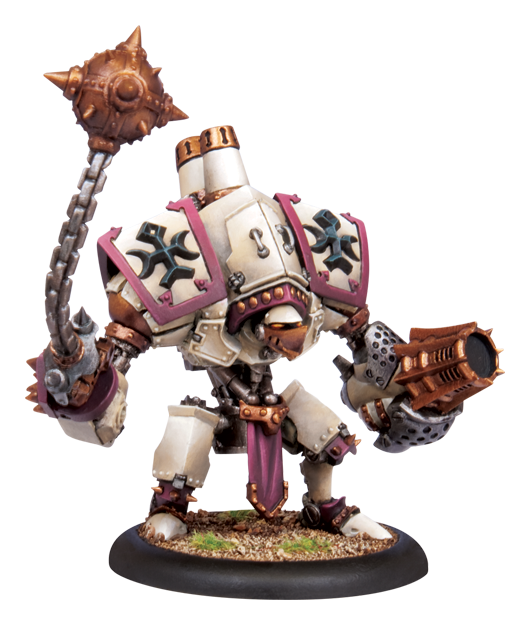 Warmachine includes five major factions, including the holy warrior Protectorate of Menoth and the necromanctic Cryx. Hordes has four factions, one of which is the nature-based Circle of Oroboros. I chose another Hordes faction, the Skorne, as the basis for my army. The Skorne are quite creepy, a savage race that enslaves and tortures various creatures into serving their cause. I was lucky enough to find a fully painted used Skorne battlebox (basically a starter pack) at my friendly local game store. Using this, I was able to learn the basics of the game. You begin by deploying your forces on a 4′ by 4′ table. The first player activates each of his or her models in turn, then the second player, and so on. Each model has a stat card that details the abilities and statistics it has. It’s fun to measure out each unit’s movements, mark status effects with tokens, and of course roll lots of dice to resolve combat. 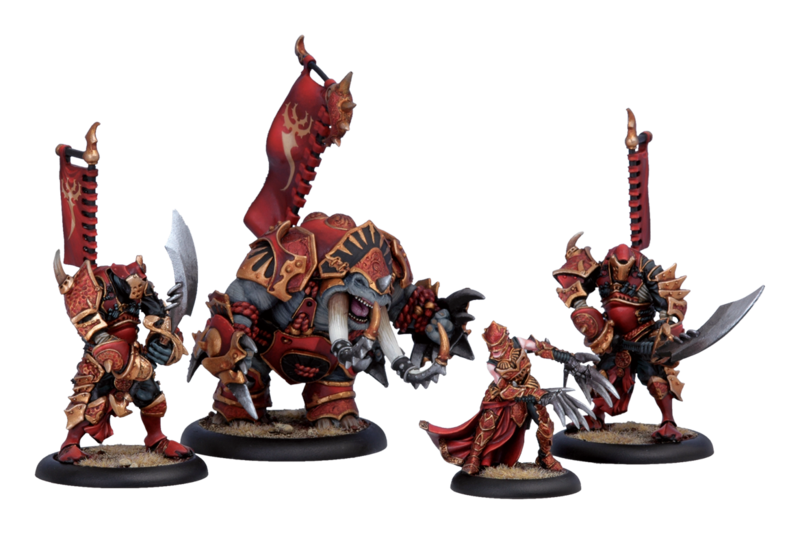 The overall objective is to defeat the leader of your opponent’s army; in Warmachine, these are called warcasters, in Hordes, warlocks. These units are the backbone of your forces, especially because of the focus and fury mechanics. Focus and fury are basically the currency that moves the game along, similar to mana in Magic. Warcasters generate a set amount of focus each turn, and can cast spells with it, or use it to power mechanical contructs called Warjacks. Warlocks feed their fury off of their warbeasts, in an elegant system that requires foresight and planning. Warmachine’s unit management is more straightforward, while managing Hordes units is more of a balancing act. Depending on the size of your collection, you can scale the number of units on each side for as epic a fight as you would like. Each unit has a point cost, and as long as all players are within a few points of each other, the game should be balanced. Most battleboxes contain from 12 to 15 points, which usually takes half an hour to 45 minutes. A typical tournament match is 35 or 50 points, and take up to two hours. I really like the scalable nature of the game, which you can custom fit to the time you have available. While Warmachine and Hordes are both great as far as game systems go, probably what I have enjoyed more are the hobby aspects. While I quickly purchased a few more painted used models, the real fun has been assembling and painting them myself. The few minis I have worked on so far are all metal, but plastic and resin are used for some models, depending on the size. You can assemble the models in lots of ways, and of course no two paint jobs will be the same. Even if you stick to the recommended standard color scheme for each faction, you can do all sorts of cool things, like alternative poses, or unusual bases, that make your models look fantastic on the battlefield. While I am enjoying my time spent playing Hordes, I realize it’s not for everyone. I was very lucky to find well-painted models for less than half off retail price, but I’ve still spent well over a hundred dollars and can only field a 25 point force at most. If I hadn’t had a fair amount of hobby gear like green stuff, brushes, paints, and other tools, the initial cost would have been even higher. There is also a significant learning curve. There are many different options and decisions to be made, and analysis paralysis can be a big factor. It’s not for a more casual gamer, that’s for sure. However, if you enjoy the concept of cool painted miniature armies fighting one another across a huge battlefield, Warmachine/Hordes is a fantastic choice. Though there is no role-playing, the game scratches many of the same itches as Dungeons & Dragons does. 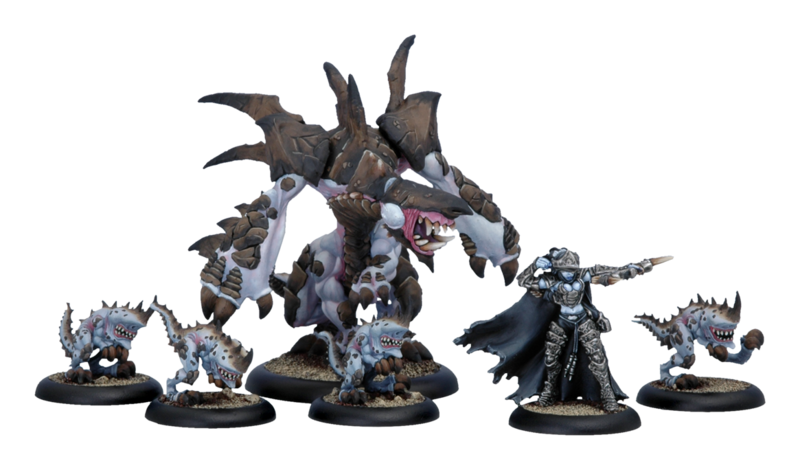 (Incidentally, Hordes models, especially, would look great on a 4E battlemap, though at 30mm scale they are just a hair big.) If you have a chance, wander over to the check out what the minis wargamers are playing sometime when you are at your local game store. You might just get as addicted as I am!